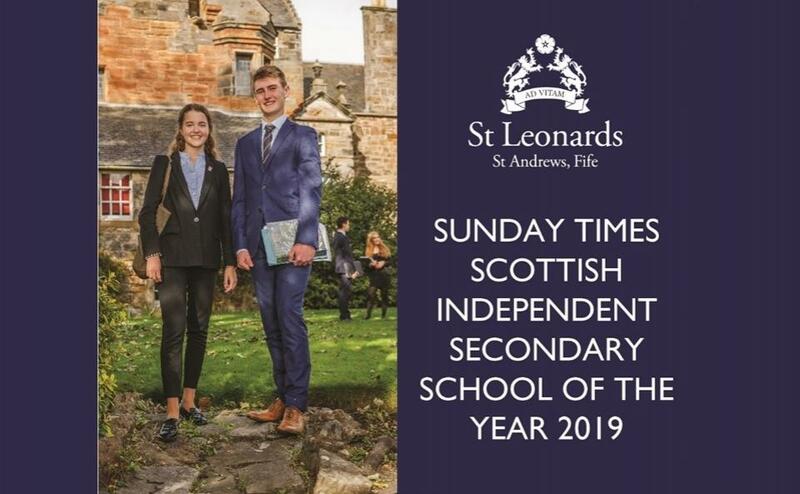 We are absolutely delighted to share the news St Leonards has been awarded the Sunday Times ‘Scottish Independent School of the Year’. St Leonards has been singled out as the leading school of its kind in Scotland, and was commended for its dynamic approach to teaching and learning, as well as its excellent examination results and recognition from universities in Scotland, England and across the globe. This Top Independent Secondary School in Scotland title adds to a strong set of recent achievements for the school: St Leonards has been ranked the top independent school Sixth Form in Scotland for A-Level / IB results for the last three years (2015, 2016 and 2017) by the Sunday Times Good Schools Guide, Parent Power. Parent Power is widely acknowledged as the most authoritative annual survey of the country’s best schools. In addition to looking at exam results at GCSE and for the International Baccalaureate it considers the all-round education on offer, including co-curricular activities, sports, university destinations for school leavers, and pastoral care. The guide Editor, Alastair McCall, has praised the school on its success: “No Scottish independent school can match St Leonards’ achievements in the sixth form averaged over the past four years. “The IB is a perfect fit for a school that is international in outlook but gloriously Scottish in its traditions and history. Under Michael Carslaw’s assured stewardship over the past decade, St Leonards has forged a distinctive personality that draws students from far and wide. “It is a dynamic and effective way of teaching and learning, from the youngest to the oldest in school”, says St Leonards Headmaster, Dr Michael Carslaw. “It is based on knowledge and understanding but also on reflecting and acting. Pupils are encouraged to be open-minded, curious, to work collaboratively, to lead their learning and master the art of presentation, preparing students for life beyond school”. The breadth and depth of the syllabus and mesh of academic and co-curricular learning continue to benefit St Leonards students, with 88% of last year’s leavers being accepted to their first choice university. “We are thrilled be named Scottish Independent School of the Year. To receive such a prestigious accolade is a wonderful achievement for the school. It is an outstanding reflection on all staff, pupils, parents and the wider school community, all of whom help to create an impressive, effective, consistent and caring learner journey from Year 1 to Year 13 and beyond. Encapsulating our school motto perfectly, we truly offer an education ‘Ad Vitam’ (‘for life’)”.